Dog people love to anthropomorphize their pets. We have all done it. Chick feels guilty for stealing the trash. Doodlebug is proud of this new Sirius Republic bowtie. People love to project our own dreams and emotions onto dog-dog relationships, too. We throw big words around — Love. Hate. Jealousy. In the case of our dogs, we do it too. We invent personalities and draw conclusions about how the dogs feel about each other, even though in reality we can rarely know for sure. In our own house right now, the Dude seems like the goofy, child-like little brother who is obsessed with his Yoda, Chick. Chick is older, wiser, too-cool-for-school, and tolerates the young ones with a stoic patience that only the most magical of dogs possess. Of course, we wish with all of our might that he adored each of the dogs that come through our home, and actually preferred having another dog in the house. But does he? Hard to say. There is no doubt that in a choice between people and dogs, Chick has always chosen people. He learned early in adoptive life that people are the ones who control all the food, beds, walks, toys, and games, so we’re more interesting than other dogs. And fosterdad and I prefer it that way. And yet, from time to time a dog comes along who Chick not only tolerates, but genuinely seems to enjoy the company of. When former foster Stevie Wonder would try to snuggle on Chick, he would tolerate it sometimes, and run away other times. But he never seeked it out. With other dogs, he has been more willing to cuddle, though I wonder if it was more that he wanted a piece of the prime real estate where the other dog happened to be sleeping, and not the warm furry body that he was seeking out. But his relationship with Snickerdoodle has us wondering whether this is a different kind of thing for our grumpy old man. Pre-Dude, Chick’s favorite resting spots were the bed in our master bedroom, the Stevie-chair in the living room, and underfoot in the kitchen. The Dude right away took to sleeping on The Dora in our guest room. Pretty soon, we started finding Chick in there, too. And there’s more. It used to be that Chick was clingy and needy to an unhealthy level. Wherever we were, he needed to be no more than four feet away. Now when we come home, if they’re in the middle of a particularly satisfying nap on The Dora, they will both come greet us, and quickly retreat back to their dogpile in the guest room. It’s new ground for us, and we’re trying to figure out whether it means anything at all. What we know for certain is that it is both unprecedented and oh-so-adorable. that last pic might be the cutest thing I’ve ever seen! I wonder if it has anything to do with the Dude being sick. Maybe Chick senses that he needs more cuddling right now. They sure are adorable together whatever the reason. Whatever it is, you’re right! Too Cute!! I just want to snuggle down with both of them! I think it is love! I also think you guys would do great with a three dog household…two permanent dogs and a foster dog! He just fits in so well! Love reading about these sweet boys! my two boys are brothers from another mother. since the day they met, they have been inseparable. although bailey is perfectly fine without jaxin, the opposite does not hold true for poor jax. in his previous life, dogs were his only constant. i think Molly K has a point; Sir Chick’s devotion may have something to do with a dose of compassion for his sick little bro. Oh to be in the mind of a dog! So cute! Izzy is such a huge cuddler with us, but I’ve yet to see her truly cuddle with other dogs. Guess she just hasn’t found her match! The last pic just melted my heart! Looks like love is in the air!! Chick told us not too long ago that he prefers dudes – and he wasn’t exaggerating. They’re too cute together. God has a way of bringing them together, They are sooooooooo Cute…Both of them… Hugs to your dogs ! Did you ever think that you might one day end up being a permanent two dog family? Looks like the Chickster has made the decision for you. Love it. These two pups are precious. Uh oh…we always said if we ever foster-failed it’d be because Oscar chose to keep the dog. He’s never been a real dog-snuggler either (now people, that’s another story). Could Chick be trying to tell you something? I love how cuddly they are together…maybe Chick can sense he’s sick? Awww, so adorable! I love how completely relaxed dogs look in their sleep, even in kind of uncomfortable-looking positions like resting on top of another dog’s knobby hip bone 😛 I’d say he likes him, though it’s true, we never quite know what’s goign through their heads! Too cute and it looks like you might have another forever family member :). We experienced something like this too. We had a 3-4 month old girl puppy that was a foster that was too busy and up in our other girl dog’s faces all the time–so much so our one girl dog would prefer to sit on the outside deck than hang with the rest of the family, our boy dog loved her most of the time. Well, along came our second foster and we are officially foster failures 🙂 Lady is older and not quite so needy and our other three seem to love her, they all get along great. The longer she stayed, the more we knew she had found her home–I think Lady knew this the minute she walked into our lives. Daaaawww… Whatever it is, it sure is cute. Welcome to the lovely “conundrum” of discovering that some dogs DO choose. I watched it with my whippets: Felix & Josephine – They did what Chick & the Dude are doing now. When we euthanized Felix due to kidney failure (4-5 yrs ago? ), I swear Josephine grieved. Not so our Great Dane. I suspect that “Dog Freak’s” comment – that you might end up being a permanent two dog family – will be a serious discussion that you have when the heart worm period is over. If you decide NOT to keep the Dude, Chick will be the same but different. You get to decide if you want Chick to be part of a pair that has changed parts of his doggie-ness. Or if you want him to go back to what he once was. Be glad that you don’t have to rush this decision. Take your time and listen to what your dogs tell you. That’s awesome that they get along so well. I think it’s love. I anthropomorphize my dogs too often too, but I do think they feel love in their own way. Chick reminds me a lot Melanie. She’s always been more aloof than other dogs, but when we brought Heidi home I noticed a similar change in how she behaves. She actually seeks out Heidi sometimes and makes a point to lay down where she is. It’s really cute and sweet and I love that Heidi brought that out in her. Looks like love to me. 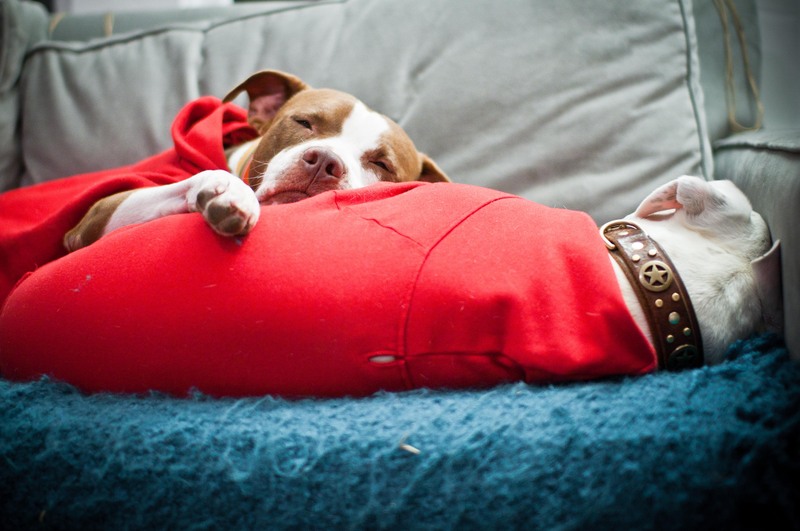 I personally feel pitties are highly sensitive dogs and companionship is like air to them – they have to have the comfort and security of another to thrive. I know mine is like a different dog now that she has two dog brothers and my boyfriend at home with her full time. Maybe Chick didn’t always find that comfort in other dogs, but he sure seems to have found it in the Dude (and also seemed to really like Gonzo BE). I am a three dog household and wouldn’t have it any other way. It’s a great feeling when your dog connects to another dog that way. They’re social animals, which makes their relationships much more complex than we tend to notice. But I’d say Chick and the Dude are pretty tight- it’s a rare thing! Oh goodness. They are the sweetest little guys together! Looks and sounds like love to me, especially in comparison to all the other dogs you’ve had through the house. I love their red hoodies! Elka has one. I’m glad Chick has found a friend! your blog always makes me smile. I love the pics. My jack came to us from the Humane Society and they always told us he would not be good with another dog but seeing him with the neighbors dog through the fence after all these years of having him…I wish we had let him try. But is it too late to let him try? Maybe he could still start making doggie friends? oh and love the red coat things on them. Jack got a blue one from his “grammie” for Christmas and he is hilarious about it. First time son tried to take it off so we could wash it, he had a fit and he sat at the washer and drying watching until we got it out and put it back on. It keeps his old bones from hurting so. Its always fun to see who a pup will take too and not. Our little Myrtle hates almost every other dog shes been near, except the 3 times her size Springer Spaniels that my dad owns. She gets super excited when she realizes we are going there. Too cute to see that happy tail wag. love, comfort, healing, companionship…whatever it is, it is clearly working for these two. 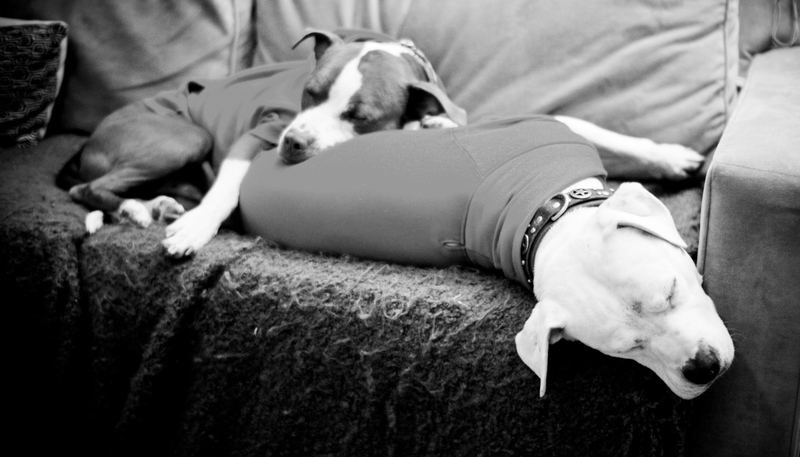 and really, is there much that is cuter than a pibble snuggle pile? I love your blog so much! I am in college and I can’t have a dog, so this brightens my day! Thank you! Is Chick making his own “adoption application” for the Dude? Could it be that Snickerdoodle is sicker than the other fosters Chick has had? I took on a “foster” who had every kind of worms known to man–including heartworms. Cassie was so sick that she’d take a couple of steps and then start to cough because of the worms in her heart and lungs. My Tessa (who is a people dog, like Chick) really took to Cassie at first–teaching her to use the pet door, showing her where to potty in the yard, even giving up her food to severely-underweight Cassie. One day, I came home from work to let Cassie out of her confinement area (laundry room with crate shoved into doorway from kitchen side, to give her a litle more rom). Connor came to greet me, but not Tessa–Tessa was lying next to the crate with Cassie in it, keeping her company until she could get out. Once Cassie got well, Tessa wasn’t as attentive–or even as kind–as she had been. Not sure what happened one day, but Tessa (who NEVER gets aggressive) growled, bared her teeth and then grabbed Cassie and threw her to the floor. They kind of walk around each other these days (almost a year since I got Cassie). I think that Doodlebug is a keeper! Chick is obviously communicating to y’all to keep Dude! They sure look happy … no question about that! Well, I too think you may be on your way to becoming a two dog family. Snickerdoodle seems to have worked his way into your hearts. I only wish you’d have come up with a different name. Every time I read Snickerdoodle I get hungry! As for humanizing (way easier to say than that anthro word) our pets, I’m as guilty as can be on that note! As long as they are treated with kindness (ie: like royalty) who the heck cares. They deserve it. 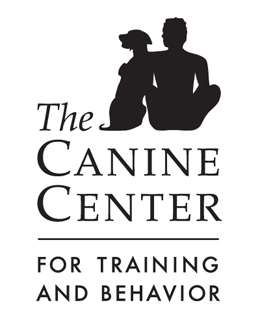 Dr. Patricia McConnell (animal behaviorist) had a great blog post in response to that Time Magazine article. The article says, “.. most scientists think [they…dogs] fall short of true friendship….. noting a lack of evidence in dogs of constancy, reciprocity and mutual defense…” found in other species. I fear you guys will regret it if you don’t adopt him! Chick has made a choice 🙂 What’s a second when they get along like that? I like to think dogs love eachother, and us too! This is absolutely precious! Maybe Chick wants a full time little brother? They sure do make an adorable pair! I miss your blog, and hearing about Chick and Dude. How about one update?